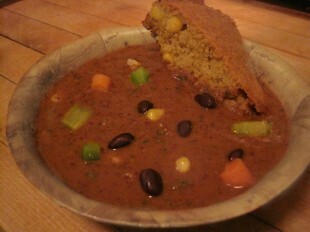 I like black bean soup to have a smooth base, but with some whole beans and other veggies to give it texture. I also like just a bit of kick to it, the amount of spice that can be quenched with a margarita, and not so much that you need to drink a glass of milk with dinner! To make this recipe you will need a hand held immersion blender or a counter-top blender. Try this soup with some warm Country Cornbread, spread with butter. Heat olive oil in a large soup pot. Sauté the chorizo until it starts to turn brown and releases its oil. Add the onion, garlic, jalapeno, bell pepper, carrots and celery and sauté until the onion is translucent and the carrots are beginning to soften. Take about 1/3 of the chorizo and vegetable mixture out of the soup pot and set aside. Stir the tomato paste into the remaining mixture. Add the chicken stock and half of the rinsed black beans and bring to a simmer. Use the blender to liquefy the soup, adding more chicken stock if necessary to thin. Add the remaining beans and reserved chorizo and vegetables . Add the frozen corn and return the soup to a simmer. Season to taste with salt and pepper, dried oregano, cumin, coriander, chili powder, lime juice and fresh cilantro.